Experience the Christmas story through the arts—jazz, painting and poetry. Jazz Noel is a Christmas meditation blending the music of the Oîkos Ensemble, the artistry of painter Michael Anderson, and the poetry of Cliff Aerie, in a worshipful setting. Michael Anderson’s (www.michaelandersonstudio.com) lengthy career as a designer, illustrator and artist continues to lead him in new artistic directions. His body of work includes murals, paintings and digital art. The inspiration for most of his works is simply the way the light falls upon the earth. 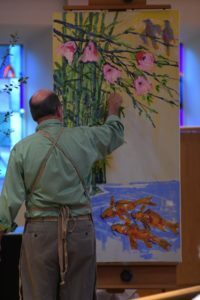 Michael is a member of the Missouri Plein Air Painters Association, the St. Louis Artist’s Guild, and Art St. Louis. Cliff Aerie (www.worshipjazz.com) is a musician, storyteller and minister, inviting others to embark on the journey of discovering the imaginative landscape of the soul, Cliff has a uniquely varied background in the arts and ministry. He has performed at international jazz festivals, hosted Jazz Alive on NPR, acted Off-broadway, pastored five congregations, founded an experimental arts ministry, and worked as a media producer before serving as Special Events Producer for the United Church of Christ. Cliff has been leading jazz worship services for more than forty years. 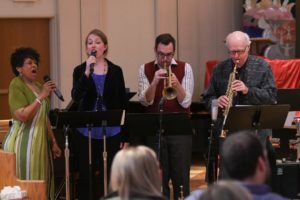 His latest project, in collaboration with Tim Osiek, is Worship Jazz, creative jazz arrangements of familiar hymns.